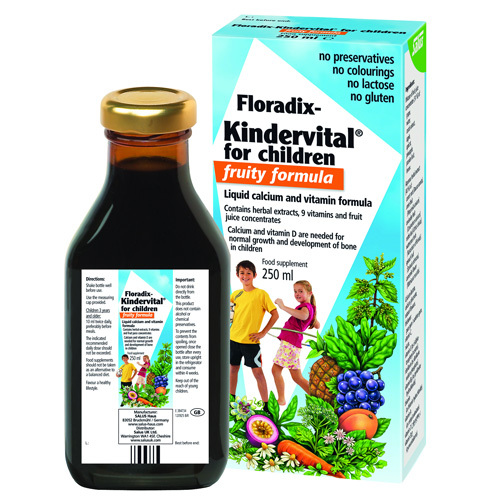 Floradix Kindervital Fruity is a delicious food supplement for children providing vital calcium and vitamin D which are needed for normal growth and bone development. Floradix Kindervital Fruity is easy to take and helps safeguard the balance of calcium, vitamins A, D, E, C, B1, B2, niacin, B6 and B12. As these nutrients are already dissolved, they are absorbed more quickly by the digestive system compared to tablets. Floradix-Kindervital Fruity contains several fruit juice concentrates and selected herbs for a pleasant fruity taste. It contains no alcohol, preservatives, colourings or artficial flavouring. Suitable for children from three years and above. Can also be recommended for adults. Carob extract, water, apricot, pineapple, grape, passion fruit, apple, lemon. Aqueous herbal extract (39%) of: carrot root (Daucus carota), coriander fruit (Coriandrum sativum), watercress herb (Nasturtium officinale), peppermint leaf (Mentha x piperita), spinach leaf (Spinacia oleracea), camomile flower (Matricaria recutita). Calcium lactate, calcium gluconate, vitamin C (L-ascorbic acid), thickener: guar gum / xanthan gum, natural flavours, nicotanimide (niacin), vitamin E (as d-alphatocopheryl acetate), riboflavin (as riboflavin sodium phosphate), vitamin B6 (as pyridoxine hydrochloride), thiamin (as thiamin hydrochloride), vitamin A (as retinyl palmitate), vitamin D (cholecalciferol), vitamin B12 (cyanocobalamin). Children 3-6 years: 10ml once daily, preferably before a meal. Children 7 years and older: 10ml twice daily, preferably before meals. Store unopened bottle in a cool, dry place (5-25°C). Below are reviews of Floradix Kindervital Fruity - Liquid Calcium and Vitamin Formula - 250ml by bodykind customers. If you have tried this product we'd love to hear what you think so please leave a review. I bought these as I was recommended this by a friend. Both my sons were always ill, and constantly having tonsillitis. I give this to them everyday, and it’s helped them a lot. Plus point is they love the fruity taste.